« Shortcut Cannoli with Chocolate Mousse Filling and a Hanukkah Blog Party! Tonight was the fifth night of chanukah. Which means that if you are partying hard in true hanukkah fashion, you have had a lot of latkes by now. Are you bored of the typical? I am. 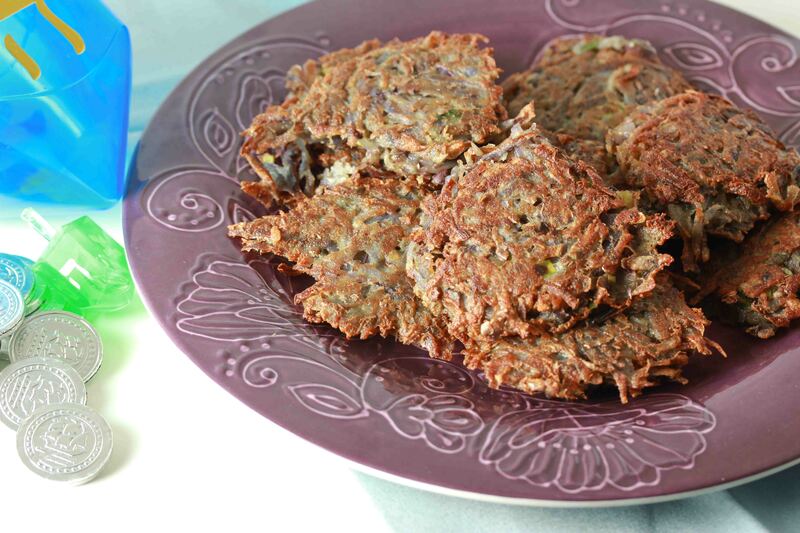 I know that the world is full of people making latkes with all kinds of interesting vegetables, spices and sauces. But I decided to go a different direction, because I care more than I should about aesthetics. Which is how this idea was born. Let’s make a pretty latke, I thought to myself. So I bought some purple potatoes. You can’t see it clearly, but the purple potatoes and flecks of green courtesy of the scallions really are eye-catching. I got a lot of skeptical questions on the picture. People wanted to know if they would keep their beautiful color. The answer? Yes and no. The potatoes did lose some of their vibrant purple color, but they still looked far prettier and way different than any ordinary potato latke. And more than that, purple potatoes have a different taste and texture than ordinary ones, making these beauties all around unique, fun and delicious. 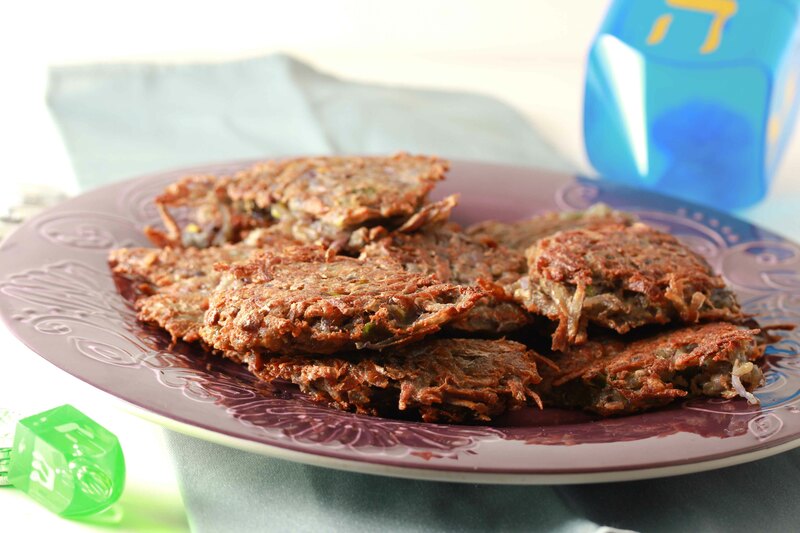 If you are experiencing latke boredom try these! In a large mixing bowl, stir together the grated potatoes, scallions, eggs and spices until combine. Form a small patty of the mixture and place in the hot oil. Fry until golden brown on both sides. 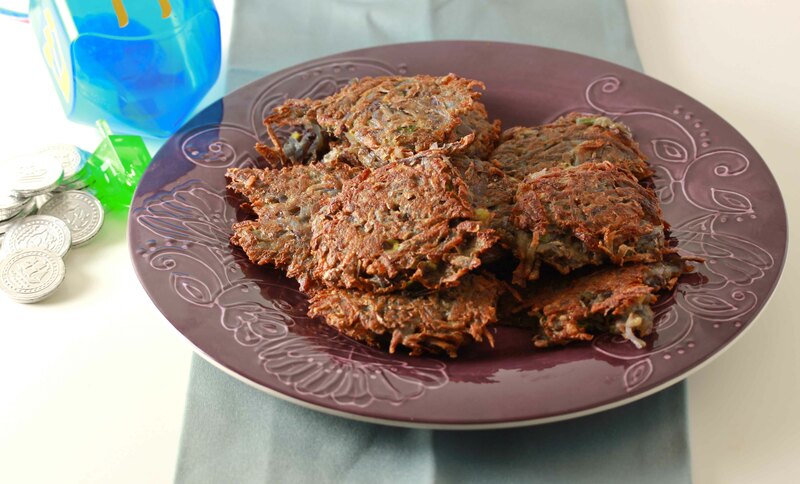 I knew I could count on you to come up with a cool new twist on latkes!! They look great. The first time I ever had purple potato was on a pizza in Australia! I’ve never found them in my local shops here in the UK but they are so pretty and taste great too – love the look of this recipe! delish! can i have one now? 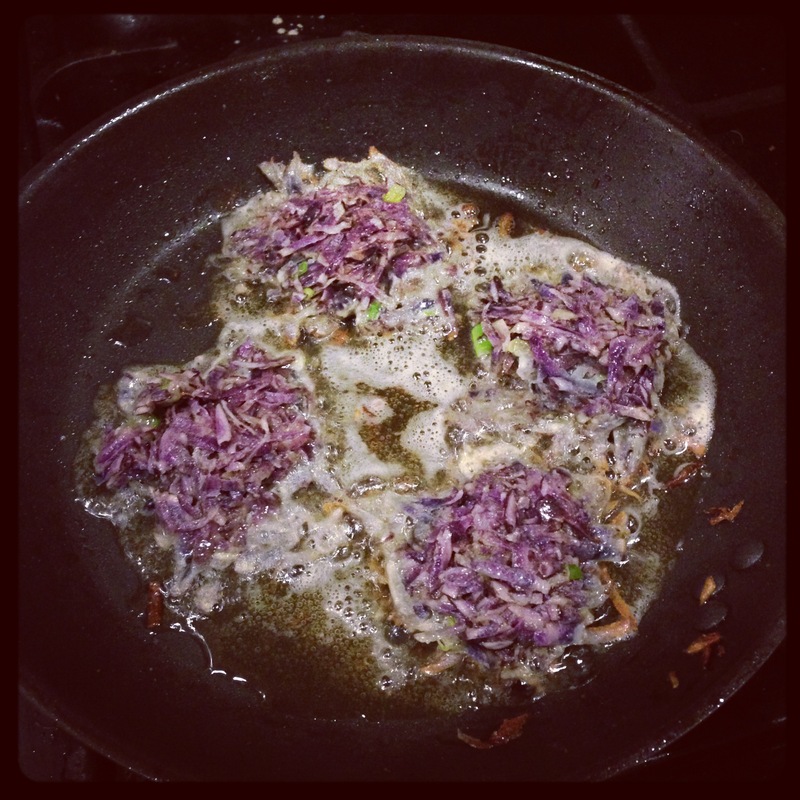 I’ve never had a latke…purple or otherwise. I’m liking the look of yours and am curious now as to how they taste. i tried to make latkes for hanukkah and literally a minute after i grated the potatoes in my food processor they turned purple. so i threw out the potatoes and at the same time threw out the idea of making the latkes. i wish i saw your blog and knew the color would cook off and they would look okay after they were fried. next time i’m trying your recipe! Ok I must’ve missed your purple potato adventures on Instagram! I saw a bunch of “unusual” potatoes (ones I’ve never even heard of!) at the one market. Next time I should buy them and try latkes. Thanks for the inspiration!